With Thanksgiving just a few short days away, here is a tantalizing recipe to accompany your main dish! 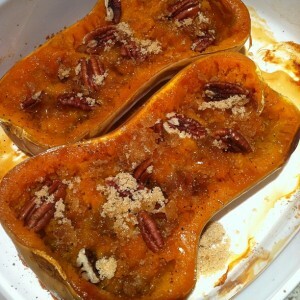 Place squash cut side down on a baking sheet and bake at 350 for an hour. Turn the squash cut side up and use a fork to gently loosen and mash the flesh, being careful to let it retain it’s shape. Season the flesh with salt and pepper, then dot with butter, arrange the pecans and sprinkle with brown sugar. Bake at 350 for 20 mins and serve hot. I used a butternut squash but you could use acorn, pattypan, hubbard, pumpkin or any other winter squash. This makes a perfect Thanksgiving side!